By Stew MagnusonI won’t presume to know what the true intentions of the Oglala Nation’s tribal leaders were when they filed the $500 million lawsuit seeking damages from the beer sellers in Whiteclay, Nebr., along with the distributors and brewers. If they wanted to bring attention to the problem of chronic alcoholism on Pine Ridge where alcohol is prohibited, and the lack of resources being put toward the problem, then kudos! In that respect, the lawsuit has already been a resounding success. I opened up the print edition of the Washington Post last week, and found the AP lawsuit story on page 2. USA Today, and other media outlets have picked up on the story. More importantly, eastern Nebraska newspapers have Whiteclay on their front pages again.That's what's happening now. But Magnuson notes another location called Swett where Indians can buy alcohol even if Whiteclay is shut down. Here's what he concludes about the lawsuit:As far as making an impact on the real problem, that remains to be seen. If the tribe prevails, and wins a big chunk of money—and if that money is put toward effective and proven alcohol treatment programs, then it could help reduce the substance abuse rates on Pine Ridge. Or, if the brewers agree to build and fund a substance abuse center as a settlement, that would be a positive outcome. Those are big “ifs,” though. 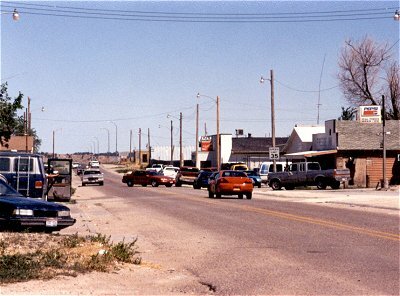 If through the lawsuit, the tribe manages to reduce the number of Whiteclay licenses, curtail the sale of beer there, or actually get the four stores shut down, it won’t result in a single sober day for a single person on Pine Ridge. Why? The answer is Swett. The shabby little town of Whiteclay is a symptom. The disease is drug and alcohol abuse. Prohibition on Pine Ridge is not a treatment. It’s like a doctor entering the room of a cancer patient and telling him: “I don’t want you to have cancer.” Then expecting the tumor to magically go away. Banning the possession and sale of booze on Pine Ridge as the Oglala Nation’s main policy to tackle alcoholism is an abject failure. Build a 20-foot high fence around Pine Ridge, fill up a moat with alligators and sharks, quadruple the number of cops, and give bootleggers the Death Penalty. None of that will help a chronic alcoholic get well and stop drinking.Comment: In 2010, various parties sued Whiteclay's beer sellers for a treaty violation. As far as I know, that lawsuit went nowhere. As for this lawsuit, I tend to agree with Magnuson's views. It's a great publicity stunt, but I don't think it has a chance of winning. Prohibition won't do much good by itself; what Pine Ridge needs is a comprehensive strategy against substance abuse. For more on Whiteclay, see Whiteclay = Genocide? and Whiteclay Protests Are "Wildly Ineffective." You are not looking at the bigger issue here. Perhaps you cannot understand that doing something is always better at doing nothing at all, even at the risk of an unwinnable lawsuit. The point here is that Whiteclay becomes an issue for the community it effects, not the pros and cons of a legal brief. I think it wise for tribes to build drug and alcohol facilities where those communities have deaths due to drinking. Otherwise, what's the use? The education starts young and in the home. If it takes a legal stunt to bring attention to alcoholism where its needed most, I'm all for it! There is never an excuse for a "legal stunt" without merit. The legal system should not be polluted by such. Perhaps if those who engage intentionally in "legal stunts" should face stiff fines to keep such matters that don't belong in the courtroom out of it. "The point here is that Whiteclay becomes an issue for the community it effects, not the pros and cons of a legal brief." To me, that's another way of saying it's a great publicity stunt. Publicity brings attention to an issue that isn't getting enough of it. So no, I didn't miss the point. If the lawsuit has a chance of winning, I don't consider it frivolous. What odds of success do you consider acceptable, DMarks, and how do you determine the odds before filing the suit? In a case without precedence like this one, I don't think anyone can be sure it'll fail.